Despite providing affordable housing to more than 10,000 residents of Miami-Dade County over the past 20 years, leaders of Florida’s largest developer of supportive housing know much more is needed to achieve their collective goal of ending homelessness. More land. More housing. More supportive services. And more resources to pay for it all. Leadership, community and national partners of Carrfour Supportive Housing, a nonprofit agency created in 1993 by the Greater Miami-Dade County Chamber of Commerce, came together this weekend for a festive celebration commemorating the group’s 20 year anniversary. 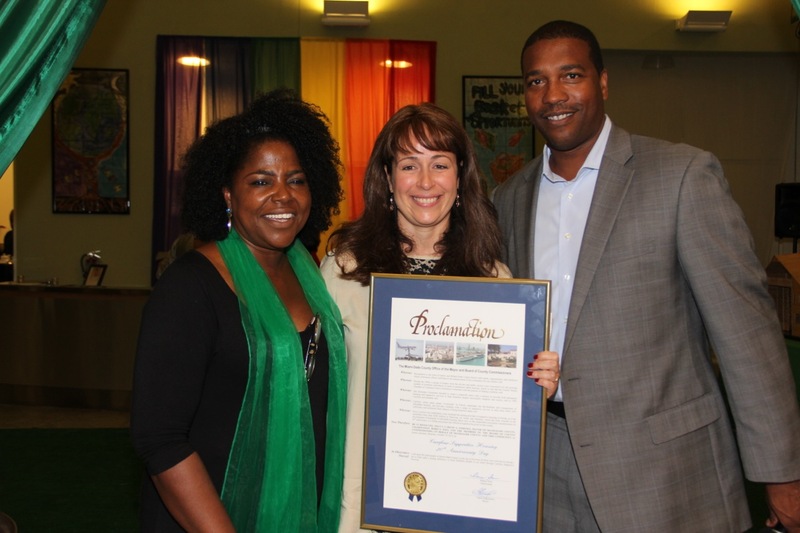 An official proclamation declaring October 19, 2013 “Carrfour Supportive Housing 20th Anniversary Day,” was presented by Dade County Deputy Mayor Russell Benford during a festive Wizard of Oz themed dinner by Chef Bernie Metz within the Carrfour Verde Gardens community that has become a dream come true for 145 formerly homeless families. 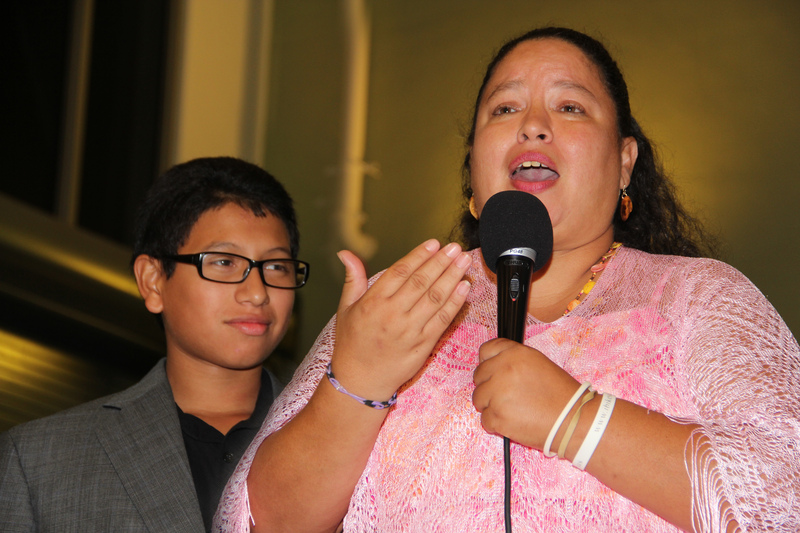 Verde Gardens resident Alma Santos, standing beside her 14-year-old son, thanks Carrfour’s leadership for changing her family’s life. Built on the site of the former Homestead Air Force Base, Verde Gardens, like many of Carrfour’s communities throughout Miami-Dade County, has become a national model for ending homelessness that has touched the lives of more than 10,000 Miami-Dade County residents over the past 20 years. 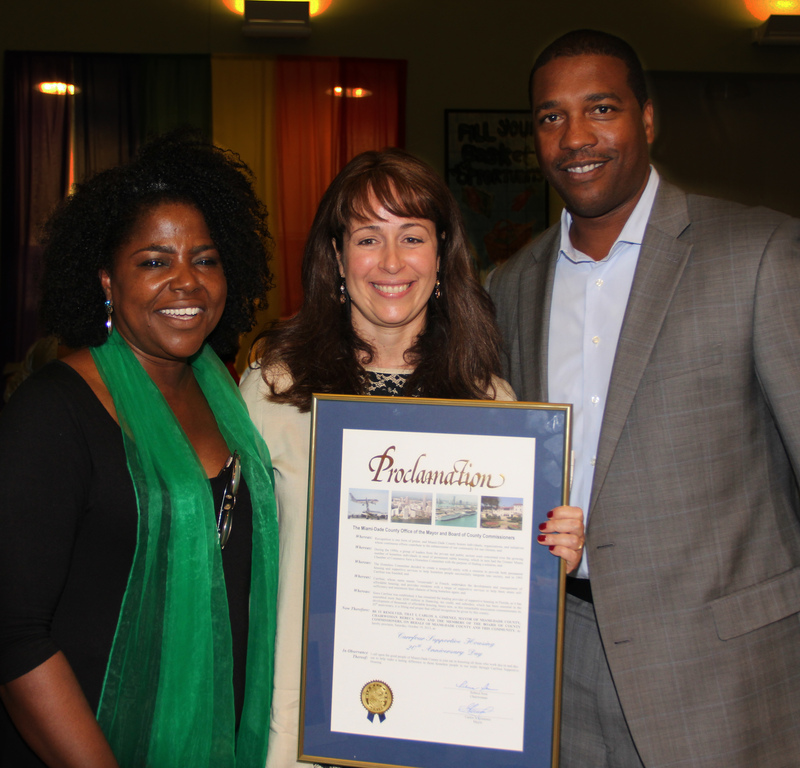 Dade County Deputy Mayor Russell Benford, right, presents proclamation to Carrfour’s Stephanie Berman, center, and Anthea Pennant. While stressing every Carrfour success involved dozens of vital contributors, CEO Stephanie Berman specifically acknowledged JPMorgan Chase and Citi Community Development with “There’s No Place Like Home” awards in appreciation for extraordinary contributions helping Carrfour confront and end homelessness for thousands of individuals and families. “Tonight is a celebration of what’s possible when our community comes together on behalf of our shared commitment to end homelessness,” Berman said. Board Chair Carol Fine thanked the agency’s local and national partners, while stressing that although Carrfour’s efforts have shown that the challenges of ending homelessness can be overcome, achieving that goal requires increased resources to continue building on successful models. The evening commemoration was organized by Anthea Pennant, Carrfour’s Director of Fund Development and External Affairs, who spoke about the impact helping end homelessness has had on her life. 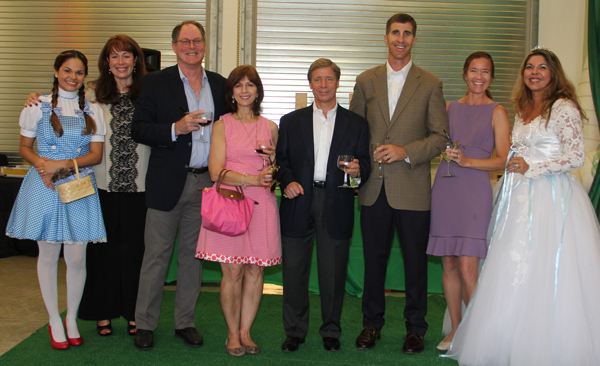 Carrfour leadership and guests at “No Place Like Home” dinner commemorating group’s 20th anniversary. From left, Paolo Roman, Stephanie Berman, Rick Fine, Carol Fine, Steve Danner, Steve Smith, Molly Smith, and Nileny Mussato. Paola Roman, Carrfour Vice President of Housing Development, hand delivered invitations to local community leaders dressed as Dorothy from the Wizard of Oz. Roman and other Carrfour managers dressed as Wizard of Oz cast members to entertain special guests during the evening to reinforce the event’s “No Place Like Home” theme. Steve Smith, Vice President of Enterprise Community Investment, traveled from Washington, D.C. to congratulate Carrfour’s leadership on their 20th anniversary and convey Enterprise’s commitment to continuing the company’s vital role helping finance development of affordable housing communities. Carrfour Verde Gardens community on site of former Homestead Air Force Base. Dade County Deputy Mayor Russell Benford, right, presents “Carrfour 20th Anniversary Day” Proclamation.